Many people incorrectly think that dental implants have an age requirement. On the minimum side, yes they do - you have to be done growing in order to be a candidate, but there is no maximum age. Because our population is continually living to much older ages, we are experiencing more tooth loss issues than ever before. Just because a person is 80 or even 90 does not mean that they should ignore their tooth loss - they need dental implants to keep their oral health in check! Not everyone does well with dentures, which used to be the tooth replacement option of choice for the elderly. Whether they are uncomfortable, do not fit right, or cause sores - they make the elderly not want to wear them. This then causes them to become sedentary because they are too embarrassed to be out without any teeth. Dental implants resolve that problem, allowing the elderly to remain active and healthy - prolonging their life even more. Dental implants are a permanent replacement that do not cause sores or any discomfort; they are a natural solution to missing teeth, giving the elderly exactly what they need to stay active. Another great benefit of dental implants for seniors is their ability to continue to eat what they love. When people have to start monitoring their diet closely and avoiding the foods they love, they can easily become depressed, which can have a chain reaction on their health as they do not get the proper nutrients to stay healthy. Dental implants make it possible to continue to eat whatever it is they love, allowing the elderly to enjoy their remaining years with us. Recovery from dental implant surgery is not as difficult as it seems. In fact, it is often easier than recovering from tooth extraction. We perform this surgery on a daily basis, which has made us experts on the topic. We know exactly how to keep our patients comfortable and safe while restoring the function of their teeth. We can do the procedure in two parts, allowing the implant to fully heal before placing the permanent crown or we can place same-day dentures, which provide immediate teeth replacement and only one recovery period. 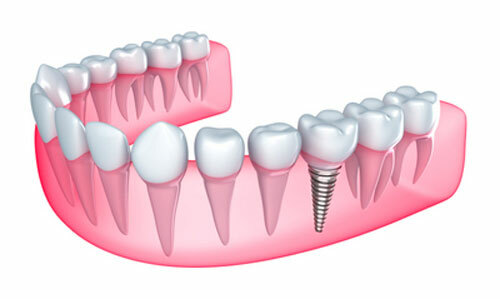 One of the key factors for anyone, but especially the elderly, is the minimized risk of bone loss with dental implants. When you have dentures, the jawbone can begin to reabsorb into the body due to the lack of stimulation it is receiving. When this occurs, you get that long, "old person" look in your face. With dental implants, however, you are able to keep your youthful appearance and abilities, making it easier to stay young and enjoy your golden years! The key factor here is that no one is too old for dental implants. As long as you have adequate jawbone to hold the implant in place and do not have advanced stages of gum disease, you could be a good candidate for the procedure. Dental implants provide the greatest level of function and the most aesthetically pleasing results for our patients. Elderly people love them because they do not have to deal with the process of removing dentures, cleaning them, and dealing with their embarrassment when they do not work correctly. If you want to avoid that and enjoy the rest of your life without difficulty, consider dental implants to replace your missing teeth today! If you are ready for dental implants, please call our office for an appointment today!